Brotherhood was an excellent political/crime drama that ran for three seasons on Showtime ending in December, 2008. The show chronicles the rising and falling fortunes of the Caffee family in Providence, Rhode Island. Tommy (Jason Clarke) is an ambitious member of the state legislature, representing "The Hill," a fictional Irish neighborhood where Tommy grew up and a stronghold of New England's Irish mob. (The Hill is an amalgamation of two real Providence neighborhoods: predominately Italian Federal Hill, and the more Irish Smith Hill.) Tommy's only brother is Michael Caffee (Jason Isaacs), who returns to Providence in the series pilot after a seven-year absence during which he was presumed dead by all who knew him. Michael is a career criminal; he returns to Providence and begins methodically amassing power almost immediately, leading to numerous overlaps and conflicts with Tommy's political career. Rose Caffee (Fionnula Flanagan) is the boys' mother - they also have a sister, Mary Kate (Kerry O'Malley). Tommy's wife, Eileen (Annabeth Gish) is silently tortured by loneliness and depression, which has taken her down a number of dark avenues including adultery and drug addiction. Add in a number of politicians, gangsters, law enforcement officers, extended family members, and local business owners, and you've got a wide-ranging cast of characters that represents a broad cross-section of Providence society. More than just sprinkled with local flavor, Brotherhood utilizes Providence as the show's main character. The Caffee brothers are not just Cain and Abel types; they are the specific products of the city they grew up in, and you can feel that. Brotherhood isn't just about utilizing the names of streets, schools, and restaurants in order to draw applause from Rhode Island viewers - it's firmly rooted in the city's history, politics, and culture. I lived in Providence from June 2008 to May 2009, and did not watch the series until recently, after I left. The show is engaged with its setting on a startlingly deep level. Clarke is Australian, and Isaacs is English, yet they both embody these Federal Hill boys with a conviction whose substance emerges from the excellent scripts, almost all of which are written by series creators Blake Masters and Henry Bromell. The looming threat of real estate development on the Hill; the parallel eradication of gangster-controlled neighborhoods and ward politics; the embedded, almost organic corruption - these are the realities of present-day Providence and they are depicted with great immediacy as faced by the Caffee brothers. Perhaps my personal experience offers a certain bias, but I could not avoid the sense that the series' creators and writing team had invested great attention toward gaining an understanding of the day-to-day reality of living and working in contemporary Providence. Masters, I've learned, is a New England native, which helps explain the fluidly integrated setting and themes. Although drawing parallels between Brotherhood and that other contemporary northeastern crime drama, The Sopranos, is unavoidable, Brotherhood's approach is more journalistic, rawer, and more immediate. That vital sense of place, and the plotlines that echo well-known contemporary people and incidents - both political and otherwise - lend great authenticity, whereas The Sopranos is more polished and operates on a scale of grand drama. In many ways the Soprano family inhabits the well-established mythos of 20th century American gangsterism - for all its originality and storytelling excellence, it still owes its roots to The Godfather and GoodFellas. Brotherhood feels fresher, more contemporary, and more real. Regrettably, this two-disc set represents the third and final season of this complex family saga. Over eight episodes (as opposed to eleven in Season One and ten in Season Two), Michael and Tommy's separate yet intertwined careers continue to mature. As each brother fortifies his position and demonstrates a different kind of power, the confluence of their trajectories becomes more obvious - and the parallels lead to increasingly higher stakes as they pursue their ambitions. In addition to the political and criminal machinations of the brothers, there are new family conflicts and crises to attend to. Rose begins to suffer from a strange illness. Eileen becomes pregnant with her fourth child. Mary Rose continues to demonstrate a predilection for petty crime. Although the Third Season does not exactly raise the tension level to new heights (I gather that the producers did not know the time of its production that this would be the show's final season), it firmly continues and extends the program's dramatic reach. From beginning to end, Brotherhood depends upon its writers and actors. In the Third Season, the writing maintains its crisp, swift, and psychologically astute edges. It feels organic on both local and universal levels. 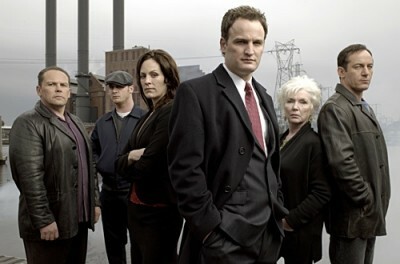 The deep roots in Providence politics, crime, and culture are reflected in the show's specificity toward both place and people. Locations continue to be used realistically - this is not one of those programs where a local restaurant is re-dressed as a nightclub; it's usually still a restaurant, and hasn't been re-dressed at all. The actors all give accomplished performances. Jason Clarke's Tommy is invested with a calm, deliberate political intelligence. His lines are delivered with a smooth, convincing confidence only occasionally betrayed by "normal" emotive behavior. Clarke manages to portray the political wheels at work inside Tommy's head through measured silences and controlled body language. Isaacs is no slouch, either. Michael is a criminal, through and through, yet his intentions are often honorable, even when committing the most heinous acts. His old-world attitude is continually frustrated by contemporary changes like real estate development (Michael's side business), technology, and the delinquent behavior of his eldest niece. Although these two performances are nearly flawless, Annabeth Gish is nothing short of a revelation as Tommy's wife, Eileen. A woman jam-packed with pent up frustrations, but without the ability to express or exorcise them, Eileen is an absolute tinder box waiting to go up in flames. Although she mellowed slightly during Season Two, her problems were never fully resolved and they remain in the background, providing all manner of tension throughout Season Three - to say nothing of her pregnancy and desire to escape The Hill for good. Gish plays Eileen with stiff, edgy body language, arched eyebrows, and a pursed sour-lemon mouth. Her haunted expressions are shadowed by visions of doom; although much of her behavior - especially at the beginning of the series - is reprehensible, there is no other character in the show for whom we wish so dearly that things to work out. The eight episodes are spread evenly across two discs, which are housed in a clear, single-width keepcase. Reversible cover art contains episode synopses on the inside. The anamorphic 1.78:1 transfers are uniformly excellent. The urban look of the show is dominated by grayish and bluish tones; for all its rough-edged dramatics, Brotherhood is beautifully lit and photographed. Providence looks just slightly better than it does in real life - the show has not "Hollywoodized" it beyond reason. Two English-language tracks are included - one in 5.1 surround, and one in stereo. The surround track is surprisingly active at times. From an overall sound design perspective, the emphasis is on dialogue, which is always presented flawlessly, even to the point of being a bit over-loud at times. Brotherhood is a dialogue-driven show, and two channels usually get the job done. Still, during the occasional scenes of action or violence, or during a scene with rain or other ambient sounds, the surrounds are well-directed and effective. The stereo track is also excellent. An additional Spanish-language mono track is optional. None. This is a real disappointment. Commentary tracks or a look at Providence would have provided valuable and no doubt interesting background context for the program. Living up to its own standards, Brotherhood: The Final Season continues to develop its characters, taking them in interesting yet consistent new directions, grown from the plotlines of the two preceding seasons. Michael is both more powerful and more respected as a criminal, and Tommy's actions as a politician become more aggressively desperate and corrupt. Although the ultimate fate of the brothers remains unknown, the three seasons of Brotherhood will last, with a reputation that deserves to grow over time as viewers discover this outstanding show on DVD. Despite the lack of bonus features, the quality of the series - and the excellent technical presentation - make this highly recommended.